As it turned out, those aren’t a terrible place to jump in. There was plenty C didn’t understand (he didn’t even know what the sonic screwdriver was), but they’re damn good episodes, and very exciting, so it was a definite win. The moment “The Time of Angels” ended, he bounced on the couch, looked over at me, and said “Let’s watch the next one! That was pretty badass!” How could I say no? Sadly, his comment after “Flesh and Stone” was “River’s hot.” Sigh. To each his own I guess. Then when I got home today he confided that while he was at work he found himself thinking about “those stone angels” and how creepy they were. He also mentioned to his wife that we were watching Doctor Who. I think if I remind them about it later, they might watch on their own one of these days. I’ll have to remember to do that. I did feel a little bad watching the episodes with commentary though. And no, before you jump to the wrong conclusion, I didn’t make C watch with commentary. That would have been foolish. I had headphones on. But that meant that every so often (and usually at totally inappropriate times) I’d burst out laughing at something C couldn’t hear. Eventually I stopped apologising. Didn’t stop elling-oh-ell though. Despite having watched both episodes just a few weeks ago, I found myself mesmerized by Matt Smith (and company), which almost made it difficult to listen to the commentary. Luckily, the RFS boys had the same problem, so it was rarely an issue. Every few minutes they’d fall silent until someone piped up with “We’re transfixed again.” I can’t say I blame them. Matt Smith just knocks it out of the park in these episodes, and that’s extra-impressive considering they were the first ones he shot. Well done Smith; well done indeed. Knitting-wise, I spent the time weaving in ends. I’ve officially made my peace with that heretofore-odious task, and I’m making it a point to catch up with that before I knit too much farther. This means the actual physical progress has stalled, but I know I’ll thank myself later. The things I do for future-Erika! She’s a lucky girl. Speaking of future-me, the few-minutes-from-now version will be attempting to watch the classic Who story “Underworld.” I say “attempting” because I’ve got it on VHS (which was taped off of PBS >20 years ago), and I’m not certain it will be watchable. (More about my recent acquisition of Who-on-VHS later.) It’s worth a try though because the next episode of TARDIS Tavern will be covering it (I can’t wait! ), and I’d like to have it fresh in my mind. 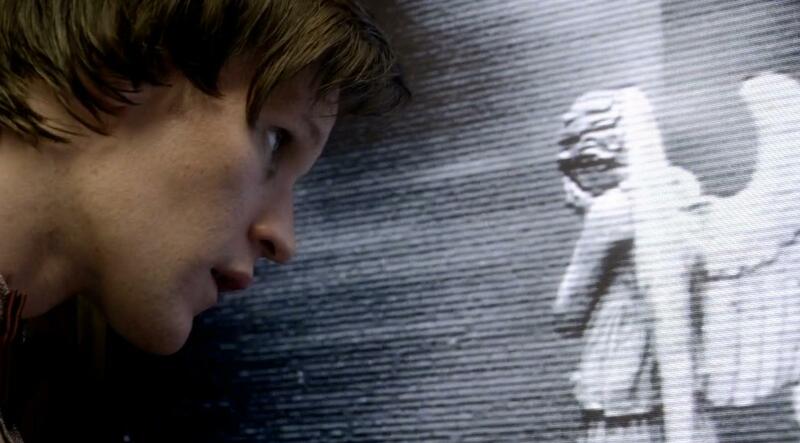 Really, when I think of the crazy amount of video snow I watched most Doctor Who through for most of my life, I realize I can handle some pretty poor picture quality, thus I anticipate success in my upcoming endeavor. So for future-Erika and myself, I’ll bid you all adieu for the night. This entry was posted in FangirlKnits and tagged commentary, Doctor Who, knitting, Matt Smith, Radio Free Skaro, Tardis Tavern. Those two episodes could easily, in my opinion, have been a feature film and are a great jumping-on point for newbies, though I do agree stuff like the sonic screwdriver and River need to be explained. I have to admit, I never did bother explaining about River at all. My houseguest didn’t seem to mind. He seemed content with the she’s-hot verdict. Again, sigh.